Two of my favorite rat-horror stories were written by H.P. Lovecraft. The rats continued their riot, stampeding with such force and distinctness that I could finally assign to their motions a definite direction. These creatures, in numbers apparently inexhaustible, were engaged in one stupendous migration from inconceivable heights to some depth conceivably or inconceivably below. --H.P. 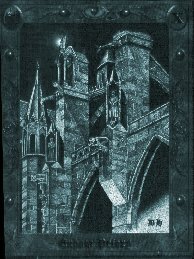 Lovecraft, "The Rats in the Walls"
In The Lovecraft Tarot, this card (Exham Priory from "The Rats in the Walls"), is card ten from the Suit of Sites (Pentacles) and indicates "a place of ancestral revelations" when used in a tarot reading. The bones of the tiny paws, it is rumoured, imply prehensile characteristics more typical of a diminutive monkey than of a rat, while the small skull with its savage yellow fangs is of the utmost anomalousness, appearing from certain angles like a miniature, monstrously degraded parody of a human skull. --H.P. Lovecraft, "Dreams in the Witch-House"
This is a close-up of Brown Jenkin, the rat-thing in "Dreams in the Witch-House." In a tarot spread, the full card depicts Keziah Mason & Brown Jenkin, the fourteenth card in the Suit of Man (Cups), and represents "dependency on others." I love to collect tarot cards for the artwork, and this creepy deck is the favorite in my collection. 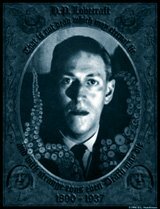 To obtain your own 78-card deck of The Lovecraft Tarot contact David Wynn at Mythos Books for details. To view more of the deck, go here: Lovecraft Tarot Cards. Even though he used rats as minor villians in some of his stories, H.P. Lovecraft is still my favorite author.